We are happy to announce BlueOrange Bank as our second partner bank from Latvia that just went live on our localized German and Austrian platforms. 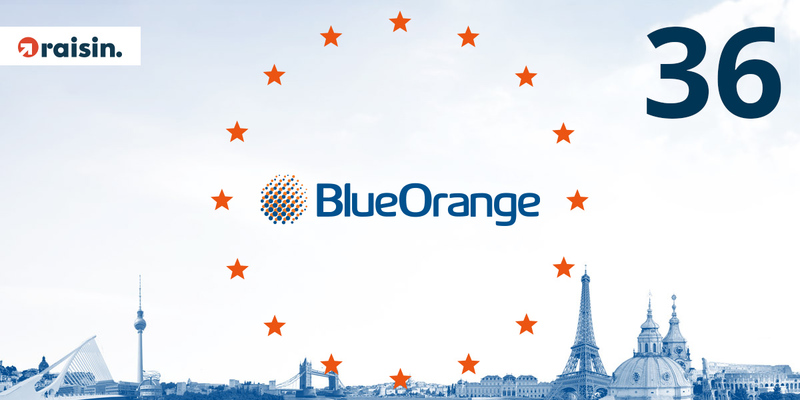 BlueOrange Bank offers term deposits with interest rates of up to 1.33 percent and a minimum deposit of EUR 2,000. The investment process with BlueOrange Bank is fully online, making it quick and simple to open term deposits. From today, Raisin customers can open and manage more than 150 savings products with 36 partner banks from 17 European countries. BlueOrange Bank, headquartered in Riga, was founded in 2001 and serves corporate and retail customers from 90 countries. The bank offers term deposits with maturities of 6 months, 1 year and 2 years. Customers can earn interest rates of 0.55, 1.11, and 1.33 percent respectively. Deposits up to EUR 100,000 per customer are secured by the national deposit guarantee scheme in accordance with EU directives.